Having problems with your social and sexual relationships? Feelings of anxiety, alienation, anguish? Traffic to and from work driving you crazy? Guru Snatchyurbananas has just arrived from Goa, India, to enlighten the western world with his proven, scientific method of T.M. 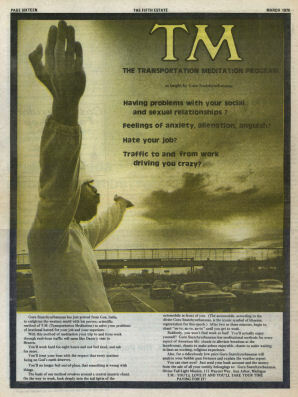 (Transportation Meditation) to solve your problems of irrational hatred for your job and your superiors. With this method of meditation your trip to and from work through rush-hour traffic will seem like Dante’s visit to Heaven. You’ll work hard for eight hours and not feel tired, and ask for more. You’ll treat your boss with the respect that every sentient being on God’s earth deserves. You’ll no longer feel out-of-place, that something is wrong with things. The basis of our method revolves around a central mantric chant. On the way to work, look deeply into the tail lights of the automobile in front of you. (The automobile, according to the divine Guru Snatchyurbananas, is the iconic symbol of kharmic regeneration for this epoch.) After two or three minutes, begin to chant “au-to, au-to, au-to” until you get to work. Suddenly, you won’t find work so bad! You’ll actually enjoy yourself! Guru Snatchyurbananas has meditational methods for every aspect of American life: chants to alleviate boredom at the Laundromat, chants to make prison enjoyable, chants to make waiting in lines an exciting, religious experience. Also, for a ridiculously low price Guru Snatchyurbananas will analyze your bubble gum fortunes and explain the weather report. T.M. : YOU’LL LOVE IT AND YOU’LL TAKE YOUR TIME PAYING FOR IT!